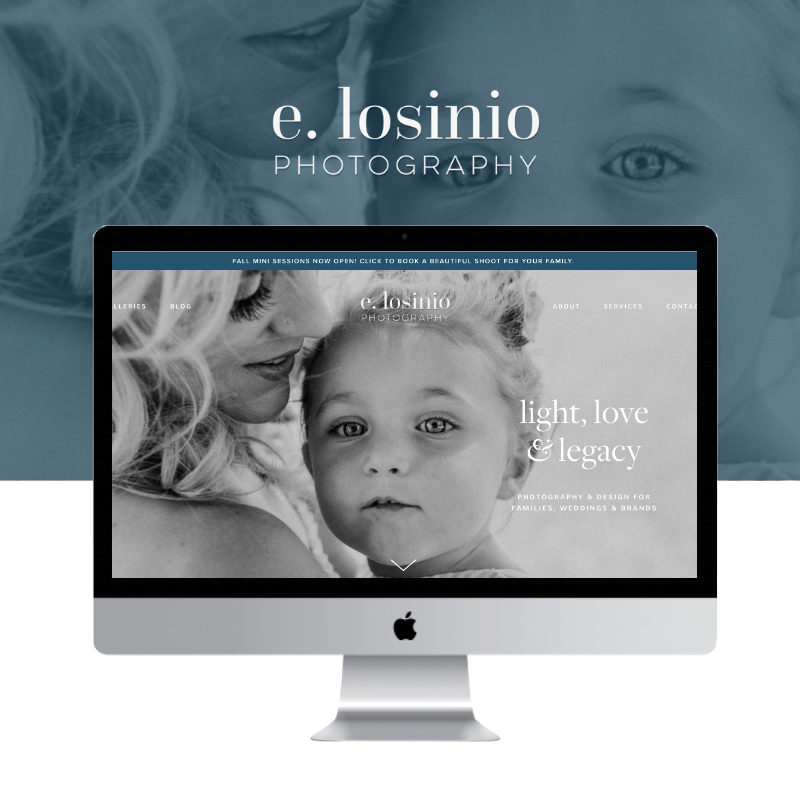 Erinne of e. losionio photography first reached out to be over the summer of 2018. She’d found me Google (I’m still a little amazed when someone on the other side of the world finds me this way, but hey, that’s because Squarespace SEO WORKS, people! ), and as we chatted amidst baby naps and diaper changes, the chemistry was immediate. Erinne is so sweet and genuine, her beautiful work has SO much poetry, and she’s a fellow mamapreneur with 3 little ones. Much less awkward when babies need to attend a business meeting! Erinne had actually already started putting together her website on Squarespace, but she was stuck on how to showcase the diversity of their offerings (3 different types of clientele, 2 different services) in a way that still felt clear and cohesive. “I struggle with website “flow” and copywriting. My goal is to have a site/brand that converts clients and helps me stand out in a highly saturated market. I have trouble showcasing my personality in a professional way, and would love to hear your ideas!” I got you Erinne!! As always, we deep-dived into the brand with 2 questionnaires to get to the bottom of their ‘why’, their personality, their aesthetic etc. I tell my clients to treat this like a journaling exercise, to brain-dump, ramble, get creative… This is a chance for them to free up their imagination and get things flowing. Some of Erinne’s brand words that guided our creative process were warm, heartfelt, classic, emotive, and thoughtful, and ‘creating legacies’ was the mission that tied everything together. Using all the juicy insight and information Erinne gave me, I worked on a structure for the site that clearly showcased the range of e.losinio’s services, creating a distinct customer journey for each of her 3 clientele, while weaving the brand’s mission throughout for cohesion. When I write web copy for a client, my goal is to ‘channel’ them, to tease out the hidden gems that they provide, and turn it into copy that’s both authentic and strategic. With e. losinio’s site, I worked on capturing the heart and poetry of their brand while being super conscious of SEO and clear messaging. Ahhhhhh. This has to be one of my favourite projects to date. Erinne was just such a dream to work with, and because our brands and styles are such a great fit, everything just flowed beautifully. I’m so proud of the work we’ve created together, and as you’ll see from Erinne’s testimonial, the website’s already making an amazing difference to her business - “we’ve gone from a handful of inquiries over the course of a few months to 10x more inquiries with 80% converting to clients within a week! '“ Woooowzers!! Being able to support creatives and change-makers like Erinne do the work they’re meant to do, and achieve the success and recognition they so deserve, gives me such a rush! My initial hesitations were related to hiring a website designer to begin with... I wasn't sure if we could find someone who could capture our voice, or convey our work in a way that felt like "us." After visiting your site and seeing how you presented yourself through your website copy and design aesthetic, I knew you would be a good fit for us! Your personality, pricing, availability, and quick turnaround time all sealed the deal for me. I've got no complaints! You've been wonderful to work with - I loved how you communicated clearly, quickly, and professionally throughout the whole process. You worked with our design aesthetic and showcased our work in a way that felt authentic to us... reading the website copy really shows that you listened throughout the design process, and I loved how you picked up on little details in our conversations and questionnaire that made our website truly tell our story. Before hiring you, our website felt incomplete, disjointed, and lackluster. After you worked your magic on it, I feel sooo proud and love how it showcases our work and services in a way that's cohesive, clear, and aesthetically pleasing. You've exceeded our expectations, and can't wait to create more content as we grow our client base!